Welcome to the Distillery District, a historic neighbourhood east of downtown Toronto that is home to dozens of heritage sites, contemporary buildings, cafes, restaurants and shops. An original pillar of Old Toronto, the Distillery District contains more than 40 heritage buildings and maintains its title as the largest collection of preserved Victorian-era architecture in all of North America. The first distillery on this site was the Gooderham and Worts Distillery, which once provided over two million gallons of whisky for international export. Gooderham’s banner still hangs as you enter the main promenade, welcoming all to bask in the illustrious past of the Distillery District. But even with nods to the past all around you, you'll be delighted to find the neighbourhood is wanting for nothing when it comes to modern convenience. 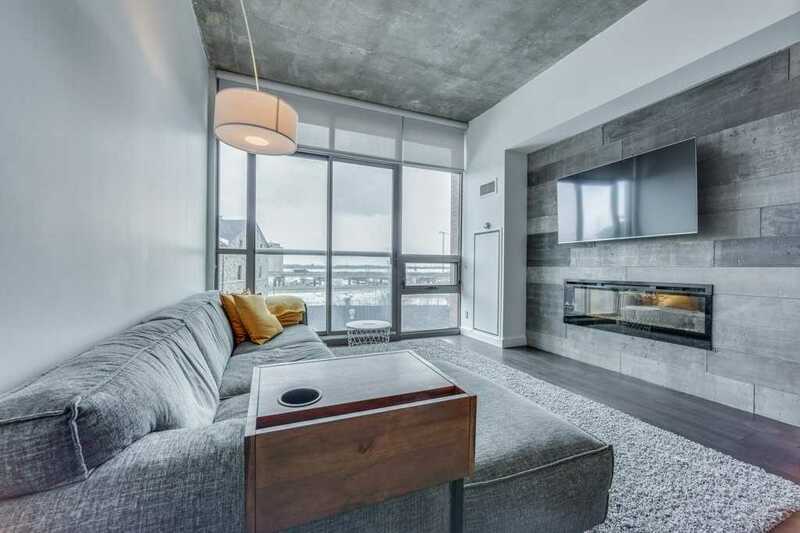 Today, the neighbourhood is family-focused, but caters to a wide array of residents by offering outstanding transit scores, terrific amenities, and some amazing outdoor spaces sure to please all tastes. 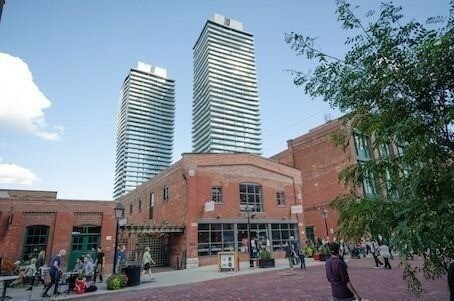 The Distillery district gets an A for its Walk Score, which comes in at 92/100. However, Distillery gets an A+ for its Transit Score, which ranks a marvellous 99/100 for accessibility. This high transit score is due to the abundance of TTC options into the area. You can reach the Distillery District by the dependable 514 Cherry via King streetcar, the 65A Parliament bus (from Castle Frank station), the 121 Fort York-Esplanade bus (from Union Station), or by walking from Union Station to the foot of the Distillery on a scenic 20 minute stroll through Old Toronto. Major highways are accessible from the neighbourhood, too. The Don Valley Parkway (Richmond St. exit) and Gardiner Expressway (Jarvis St. exit) are your closest freeway neighbours if your taking a drive out of the city. Who lives in the Distillery District? Families and students take advantage of the schools that surround the Distillery District, while seniors and remote workers enjoy the ease of living and convenience of downtown. The following data was obtained from the 2016 South Riverdale neighbourhood census profile, and the City of Toronto Ward 30 profile. Average prices are determined by the realestatecondos.ca listings. The Distillery Districts is a decidedly lively place, with noisy patios and energetic pubs lining its major streets. It's proximity to downtown opens residents to a whole other set of options, making it a fantastic place for foodies, nightlife enthusiats and families looking for team fun. First, we have to mention that owning or renting in this neighbourhood means you’re surrounded by the rich history of Toronto’s Distillery District, brimming with amazing shopping and dining options. The historic grounds alone will be enough to fill your evenings for years to come. There are also tons of coffee shops, in case you need a relaxed environment to do some remote work or catch up with a friend. Surrounding amenities include the St. Lawrence Market, another famous landmark of Old Toronto. This market is where everybody in the city flocks to find the rarest and most specialized groceries in all of Toronto. There are both classic and modern spaces to grab a celebratory drink and meal with your loved ones. One of the most famous places is the Old Spaghetti Factory on The Esplanade. There are also new restaurants that cater to the diverse culinary crowd in the city; you’ll be able to find a reputable bistro, oyster house, taqueria or sushi bar on any food adventure through the neighbourhood. The area Mill Street is about as densely populated with restaurant options as you can imagine, so it'll be easy to keep things fresh after joining the neighbourhood. The Distillery District is close to many of Toronto’s premiere entertainment venues, including the Scotiabank Arena (formerly ACC), Roger’s Centre, REBEL Entertainment Complex, Cabana Poolbar and the Harbourfront Centre. Since the Distillery District is pretty close to Lake Ontario, you have easy access to both Cherry Beach and Sugar Beach, plus the Waterfront biking/running trail which will connect you to the rest of downtown. The Distillery District has great access to educational facilities, with numerous junior and senior public schools in the community. George Brown College’s St. James Campus is also within walking distance of the Distillery, which makes the area popular for college students. For the younger scholars, Lord Dufferin Junior and Senior, Market Lane Junior and Senior, and Nelson Mandela Park Public schools are nearby. Inglenook Community High School is an alternative option offered to students between the grades of 10 and 12. Since this neighbourhood is so close to the water, there are several parks and recreation opportunities for those itching to appreciate the Toronto's natural amenities. On the west side of the District you’ll find five consecutive blocks of public parks, basketball courts, baseball diamonds and jungle gyms that serve as community hubs and meeting places along The Esplanade. On the east side, you’ll find Corktown Common, another community hub that opened in 2013, which sets the standard for Toronto parks. From the Distillery, you can walk over to the Harbourfront and catch a ferry to the Toronto Islands and explore one of the city’s best spots for a daytrip. And of course, being close to some of the city's best beaches makes Distillery a fantastic place to be in the warmer months.